Swimming laps provides an excellent cardio workout. A hot, steamy yoga workout or a cool dip in the pool -- how's a girl to choose? While these exercises share some of the same benefits, including improved mood and stronger muscles, swimming is aerobic whereas yoga combines stretching with strength training. The specific health boosts of either activity will net you a fitter body and mind, but you don't need to choose just one. To make the most of your exercise routine, incorporate both yoga and swimming into your weekly schedule. Swimming is the aerobic choice, and aerobic exercise should be a major part of your exercise plan due to its heart-healthy effects. The Centers for Disease control and Prevention recommends at least 150 minutes a week of aerobic activity; exercise up to 300 minutes weekly for optimum benefits. Swimming protects you from cardiovascular illnesses such as heart attack, high blood pressure and stroke. It even helps you maintain healthy cholesterol levels while strengthening your heart to improve blood flow. While yoga may have some cardio benefits, they aren't as significant. During hot yoga sessions, you'll stretch, bend and twist your body into positions that you'd never perform in everyday life. In addition, your warm muscles will be more pliable and possibly more receptive to change. This leads to increased flexibility that you won't get from swimming. Flexibility is important for athletic performance and can also prevent injuries. The greater your range of motion, the more easily your body can perform activities such as walking uphill without strain or trauma. What's more, yoga builds balance, which will help guard you against falls. Hot yoga may be famous for relieving anxiety, but don't dismiss swimming just yet. The truth is that every form of exercise fights stress by causing your body to release endorphins, as well as targeting your focus on the task at hand. Performed regularly, exercise reduces depression symptoms and boosts self-confidence. So for anxiety relief, simply choose whichever activity proves most effective for you. 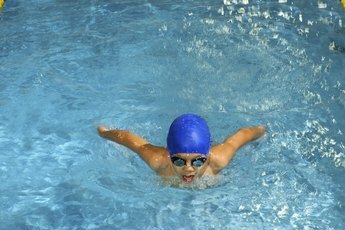 If you aim to shed pounds, swimming is for you -- provided you're willing to work hard in the pool. At 155 pounds, both yoga and treading water at a moderate rate burn just 281 calories an hour. If you tread water vigorously, however, you'll burn more than 700 calories in that same time frame. Swimming laps vigorously will burn an equal amount. 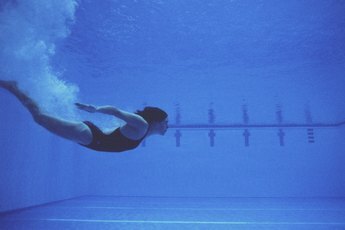 Even swimming laps using a light freestyle stroke will melt 563 calories per hour, more than double the amount of yoga.